Welcome to my personal space on the web ↯. Engrams are memory traces of whatever interests me. Trace your own path through these engrams by clicking on tags. For more info on me and this website, see the about section. The etc section contains more static content, e.g. a short c.v. There is no regular posting schedule. Subscribe to the RSS feed! Feedback? An idea for cooperation? Please feel free to contact me. When one starts studying logic one is likely to be surprised by the workings of the so-called material implication, p –> q (if p, then q). Unlike the implication used in natural language, which can for example indicate causation, the material implication has a more restricted meaning. The material implication is true unless p is true and q is false. This is ultimately a matter of definition to resolve ambiguities present in natural language. 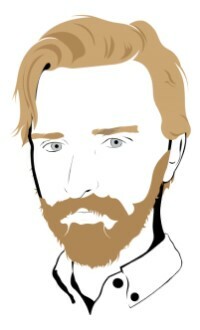 My friend Rits did me a big favor by making some digital portraits of me. His website is currently in quarantine because he was too late with re-registering his domain name, but if you read this post after sunday 17 March you can check out his web site. While doing me a favour, Rits made sure that he enjoyed himself. See right for a first proof of concept. After seeing this sketch, I had complete faith in the end result. A few days ago Djoerd Hiemstra gave a guest lecture on estimating the size of big data problems, within the context of a Big Data course I am currently following. As a preparation, we read the paper of Sergey Brin and Lawrence Page from 1998 (read it here) where they introduced the anatomy of their search engine called “Google”. We did so in particular because it is interesting to compare their estimations on the size and scalability of Google with the colossus it has become today. A year ago I attended a lecture by Timothy Morton. I had not seriously read anything of Morton except a quite extravagant paper called “From modernity to the Anthropocene: ecology and art in the age of asymmetry”, which flamboyantly combined Hegel, art and ecology in a manner I do not recall. The lecture was equally flamboyant, and can perhaps best be described as a confused rant that simultaneously felt very genuine and personal. Two short updates: 1) I designed a minimalistic “Dark Theme” for this website. It can be selected in two ways. If your browser supports it, you can manually select the page layout. For example, in Firefox you can press Alt -> View -> Page style -> Dark theme. However, this makes the selection only for the current page. A slightly less transient option is to use the switch button in the navigation bar. A friend challenged me to implement the option to leave comments on blog posts over the Christmas break, and rightfully so. I write these posts about things that currently interest me, not because I think I know it all, but to record a thought process or idea for later review by me or others. A blog is not the place for publishing well-polished papers, but instead ideally is a playground for developing and testing ideas in interaction with others.